Ariel Jackson, The Blues Data Crop: The Gains and Losses of Black Farmers in America, 2016, screen print and found fabric on muslin, found fabric, wire, polyester fill, wooden dowels, ink on muslin, soil, dimensions variable, Sunroom Project Space, Wave Hill. Courtesy of the artist. Photo: Stefan Hagen. Thanks for taking your time to do the interview. I see that you are very busy with projects. 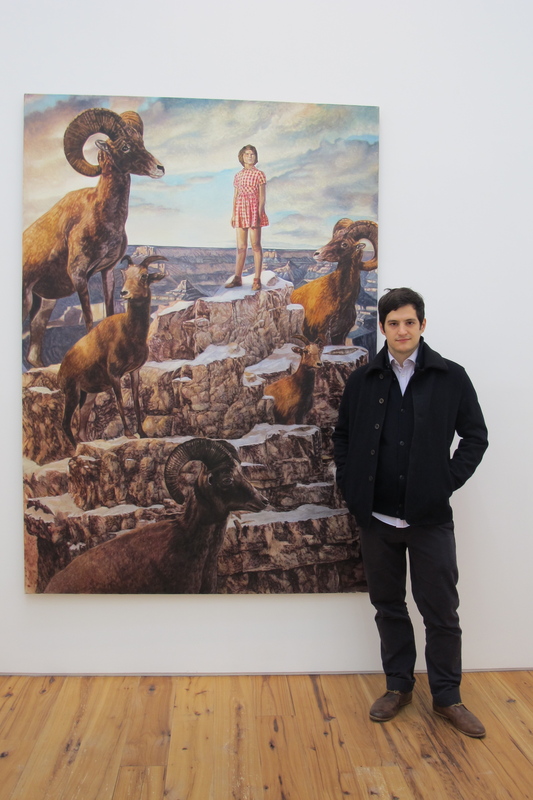 Can you tell me about your background in the arts and how you ended up in NY curating shows? Thanks for inviting me to do the interview. I took a circuitous route to get to the arts. No one in my family had a background in art, and my parents never even took me to an art museum when I was growing up. They felt that art was superfluous, so it wasn’t encouraged. And they didn’t feel that art museums were welcoming places for immigrant families of color. But I took World History and AP Art History classes in high school, and that’s what really sparked my interest. I was fascinated with the idea that studying the material culture of people of different eras could reveal so much about how they lived. History doesn’t have to be about memorizing a timeline of events of great men. Studying art and artifacts could help us understand the history of humankind, and also that we could learn from the past in ways that help us comprehend our lives today. Eventually, I got a B.A. in art history at the University of Virginia (UVA), and then an M.A. in art history at Hunter College. At UVA, I got a solid background in art before 1900, but studying 20th century and contemporary art movements at Hunter got me excited about what was happening in the New York art world. 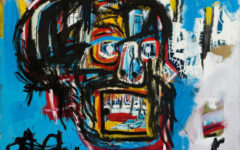 As an emerging curator, I really cut my teeth at The Jewish Museum, working on modern and contemporary art shows there. The exhibitions addressed contemporary topics but always in a larger context, exploring the cultural, political, and historical aspects of the past that inform the art of the present. When I started at Wave Hill in the fall of 2010, I had been interested in how artists are exploring the intersection of the natural and the built environments. Our relationship to the natural world seems to be an increasingly relevant topic and one that we, and the artists we work with, continually go back to at Wave Hill. We currently have the Call & Response exhibition on view (through December 3rd), which celebrates the 10th anniversary of our Sunroom Project Space, a venue for emerging artists to create solo projects that respond to Wave Hill’s site. Fifty artists are returning to present new, site-specific works ranging from art objects made with natural materials, to sound and video pieces, outdoor installations and performance projects. It really showcases the sense of inspiration and experimentation that Wave Hill has engendered for many years. In addition to my curatorial work at Wave Hill, sometimes I organize exhibitions as a guest curator for other art institutions. My outside projects allow me to explore other topics of interest that don’t necessarily fit with Wave Hill’s mission. 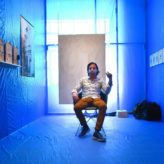 I have curated shows for a variety of art spaces, such as Rush Arts Gallery, The Bronx Museum of the Arts, Northern Manhattan Arts Alliance, the Affordable Art Fair, En Foco, and Dorsky Gallery Curatorial Programs; these projects have investigated cultural identity, immigration politics, community, and geometric abstraction. Currently, I’m working with the staff at Smack Mellon to present an exhibition called UPROOT. It opens November 18th in their space in DUMBO, Brooklyn, and looks at how artists are responding to our current political situation a year after the 2016 presidential election. In these troubling, uncertain times, I think it’s always important to turn to artists and creative thinkers for guidance. We need their energy and ideas more than ever. 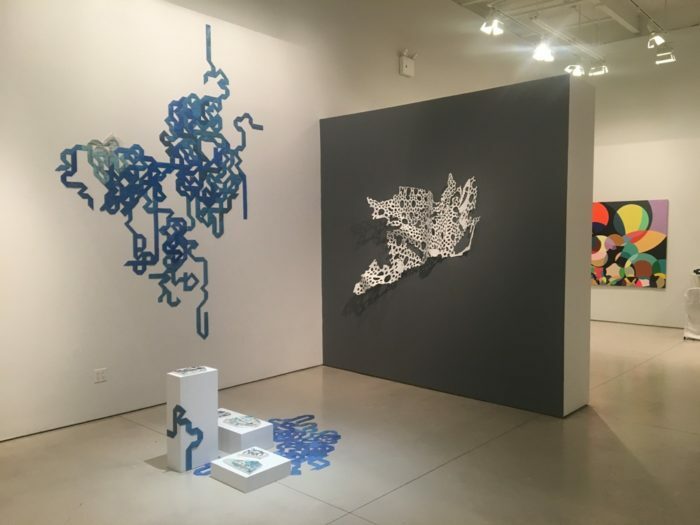 Disarming Geometries (installation view), left to right: Shanti Grumbine, The Last Color: A Reliquary, 2016; Samantha Holmes, Geometric Application XI, 2015; hannes bend, mUltIverseS, 2008. Courtesy of the artists and Dorsky Gallery Curatorial Programs. We love what they do, and we cover their shows all the time. I am sure you will get a lot of responses since our political situation is so dreadful. How do you start the process of putting an exhibition together? The way I start the exhibition process varies depending on the situation. I usually start with an exhibition topic or theme that I want to investigate. If it’s for Wave Hill, I work with my colleagues in the Visual Arts department to brainstorm ideas that are relevant to Wave Hill’s mission. We present exhibitions that explore human connections to the natural world, whether that is related to landscape, environmental issues, botanical imagery, or directly related to our gardens and site. 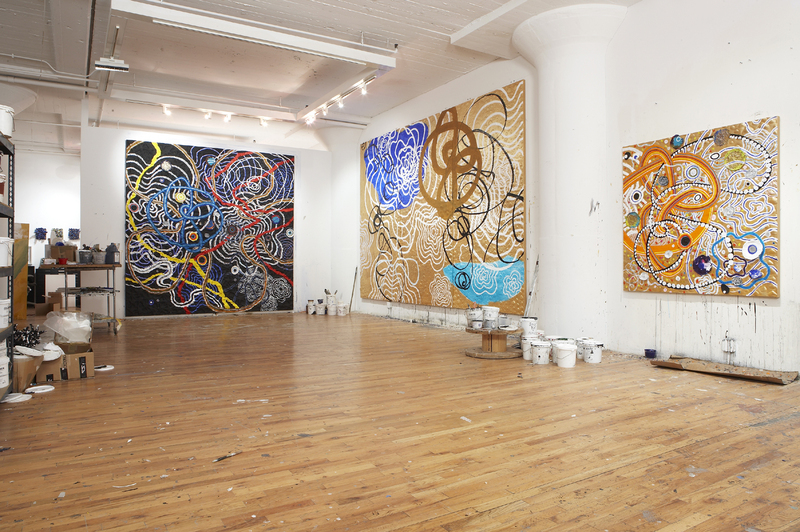 Through a variety of methods, we find artists whose work fits the topic including open calls, studio visits, attending contemporary gallery exhibitions, or doing research online. When I am guest curating an exhibition for another venue, it gives me an opportunity to investigate other topics that inspire me. They often address contemporary concerns that resonate both on a personal level and in larger cultural contexts. Exhibition ideas come to me when I am feeling concerned about the current state of affairs or if I am seeing exhibitions or visiting studios and notice that several artists are addressing similar themes in their work. And then I do my homework to find artists and build an exhibition that represents multiple facets of the theme. There are also artists whose work I admire and keep mental notes on until I find an exhibition topic or a venue that would make sense for their work. Diversity and inclusion in the arts are very important to me, so I always aim to show artists who represent a variety of cultural backgrounds, genders, perspectives, approaches, techniques, and media. As I mentioned, my parents never felt that art museums were places for my family to visit, and I think it’s because they couldn’t see themselves in the artists or the work represented. Because of that, I take my role as a curator seriously by attempting to be as inclusive as possible when I work with art institutions and on exhibitions. Call & Response (installation view), left to right: Brandon Neubauer, Dead Reckoning, 2017; Kristyna and Marek Milde, In-Tree-Net, 2017; Amie Cunat, Arbor in Tar and Charcoal Grey, 2017. Courtesy of the artists and Wave Hill. Photo: Stefan Hagen. 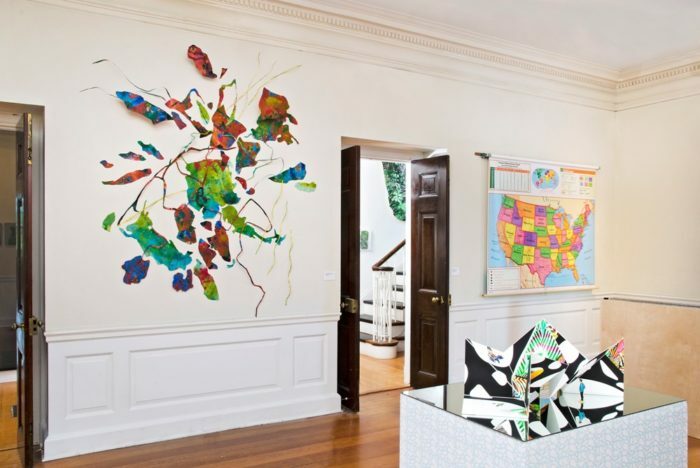 Call & Response (installation view), left to right: Francisco Donoso, Bronx/Dis-Bronx/Re-Bronx/Non-Bronx, 2017; Peter Gerakaris, Ventana Origami Sculpture, 2017; Kim Baranowski, Early Learning, U.S. Map, 2017. Courtesy of the artists and Wave Hill. Photo: Stefan Hagen. I admire you for using a lot of diversity and varied cultural backgrounds in your shows. We need more curators like you since America is mixed with so many cultures. Can you talk about the current exhibition at Wave Hill, Call & Response? 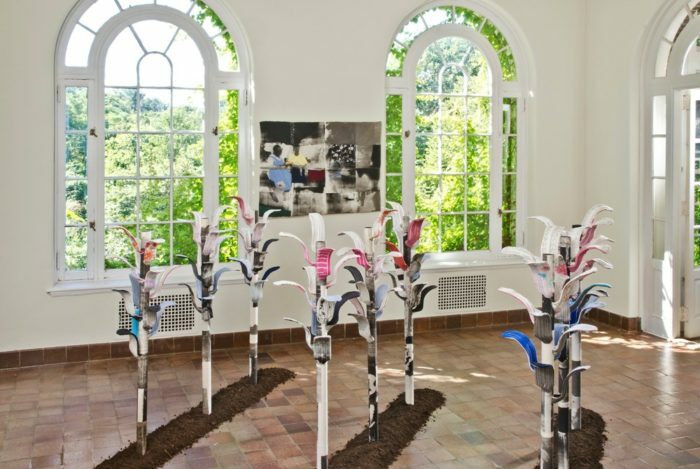 Sure, Call & Response is an exciting exhibition that marks the 10th anniversary of Wave Hill’s Sunroom Project Space, which is a venue that presents site-specific installations by New York-area, emerging artists in one of our two sunroom gallery spaces. Since 2007, we’ve shown 60 artists who have created a wide range of responses to our site. Speaking of diversity and inclusion, more than half of the artists we’ve shown in the Sunroom have been people of color, and the majority have been women. For this exhibition, 50 alumni artists have accepted the invitation to come back and present new work that is inspired by Wave Hill. We’ve filled the gallery with projects that range from art objects, to digital and video art, to outdoor installations and performances. When we began organizing the exhibition, I wanted to think about the notion of site-specificity and how it remains relevant today, in the digital age, when concepts such as location and place are becoming more virtual and dematerialized. Many of the artists are engaging with and challenging what site-specificity means. 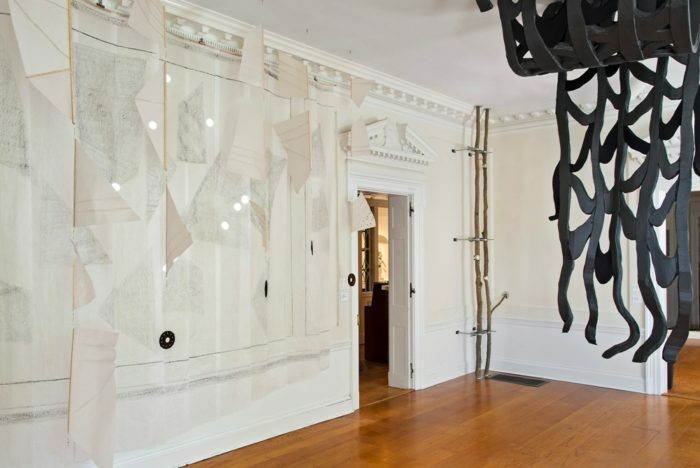 Some are using new technology like augmented reality to make virtual interventions on the site, while others are using analog processes like altering found objects sourced from Wave Hill. And several artists are combining mechanical processes, like 3-D printing, with handmade work, like carved or sculpted objects, in a way that blurs the boundary between simulation and original. The artists have found such compelling ways of engaging with Wave Hill’s site! 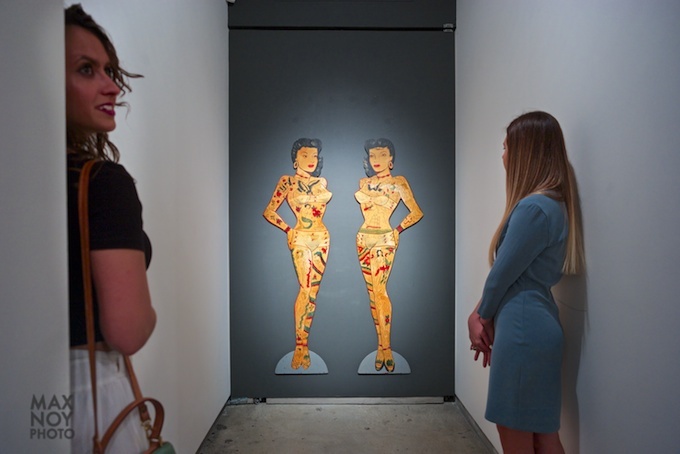 Dimensions Variable: Multiracial Identity (installation view), left to right: Firelei Baez, gouache and ink drawings on paper, 2013; Saya Woolfalk, mixed media sculpture and mixed media on paper, 2012. Courtesy of the artists and Rush Arts Gallery. Do you have any advice for emerging curators? Yes, starting with graduate school, I think aspiring curators should be sure to get to know the MFA students at their school. 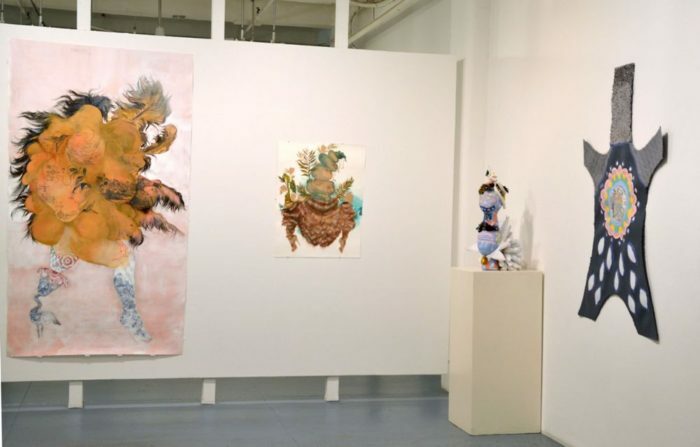 Attend the open studios and go to MFA thesis shows. In the best case scenario, you become part of a community of rising art curators and artists who support each other in their careers. It also helps you understand what motivates the work of very current artists. I went to Hunter College for my MA in art history several years ago, and I regret not spending more time in the MFA building. Hunter has a fantastic studio art program, and I don’t think I appreciated that enough as an art history student. Now as a contemporary art curator, I make an effort to go to Hunter’s open studios and MFA thesis shows. And I am often invited to do studio visits with MFA students at Pratt, Parsons, City College, and other schools. That said, I think it’s also important to look beyond MFA programs for a wider view of what contemporary artists are concerned with. I try to attend the many open studios offered throughout the city, in Bushwick, Greenpoint, Gowanus, South Bronx, Long Island City, Uptown Manhattan, LMCC, and Jersey City—not to mention the incredible number of gallery openings and art events happening around town. It’s important for emerging curators to attend art events, but then I think it’s also necessary to balance that with downtime. Sometimes I like to hunker down at home in front of the TV and watch hours of cooking shows on the Food Network! It’s a terrible waste of time, but somehow it helps me recharge. Gabriel de Guzman with Tai Hwa Goh’s Overflow, 2016, Sunroom Project Space, Wave Hill. Congratulations on your new position as Curator and Director of Exhibitions for Smack Melon. How exciting! What do you plan to accomplish at Smack Melon? Thank you, Jamie! This just happened in the last week or so. Although I’ve enjoyed seven wonderful years at Wave Hill, and I will miss the beautiful context for showing art, I felt that it was time for me to move on to new opportunities. 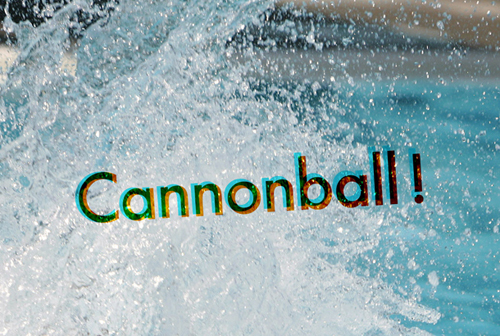 I’m looking forward to curating UPROOT and other upcoming exhibitions at Smack Mellon. The space is so industrial—and muscular! I’m looking forward to working with artists who can take on the challenge of engaging the immense space, with its 35-foot high ceiling and its brick, cement, and steel interior. Another reason I was so drawn to the position at Smack Mellon is because they support emerging artists from diverse backgrounds. It’s rare for artists who are not represented by commercial galleries to be given an opportunity to create immersive installations in a space of this scale. In Smack Mellon’s exhibition guidelines, it specifies that 60% of the artists included must be women, which is fantastic, because it’s even more seldom that women have a chance to present large-scale projects. Cultural diversity is also important to Smack Mellon, and the UPROOT exhibition is going to be very diverse because my aim is to represent a much wider range of voices that have been acknowledged by the current administration. I’m hoping eventually to expand the exhibition program at Smack Mellon to include more artists who are trans or genderqueer, artists with disabilities, and other underrepresented artists. I see potential partnerships with various communities to be crucial to making that happen. Also, Smack Mellon does not shy away from current political concerns, so in my role, I plan to continue supporting artists who are brave enough to confront the issues that affect us. Joiri Minaya, #dominicanwomengooglesearch, 2016, digital prints and fabric on Sintra, dimensions variable. Courtesy of the artist. Photo: Stefan Hagen. Looks like you have a full plate. I am very happy for you, and I wish you all the luck in the world at Smack Mellon. My studio is two blocks away, so I always stop by to see their shows. It’s a great neighborhood. Can you give me a couple of artists that you are really into right now? Yes, stop by anytime. And can I drop by your studio for a visit sometime? I’d like to see what you’ve been working on lately. Oh, it’s tough to pick just a couple of artists because I’m interested in so many! I hope you won’t mind if I name several. Ariel Jackson’s work is so compelling. 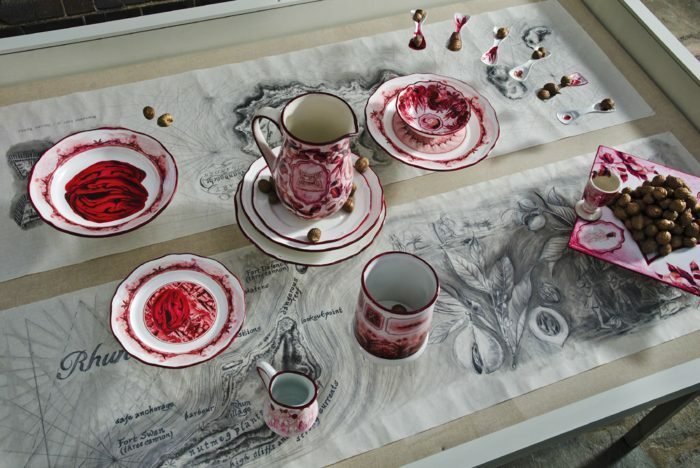 She works in video and sculptural installation and combines personal, historical and fictional narratives. She just started an MFA program at the University of Texas at Austin. I can’t wait to see what she does next! 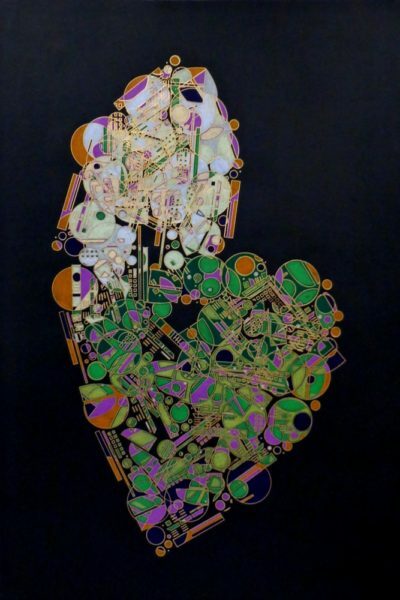 Glendalys Medina is a mixed media artist who works in abstraction in ways that refer to both personal and universal sources, or perhaps “multiversal” is the right term. 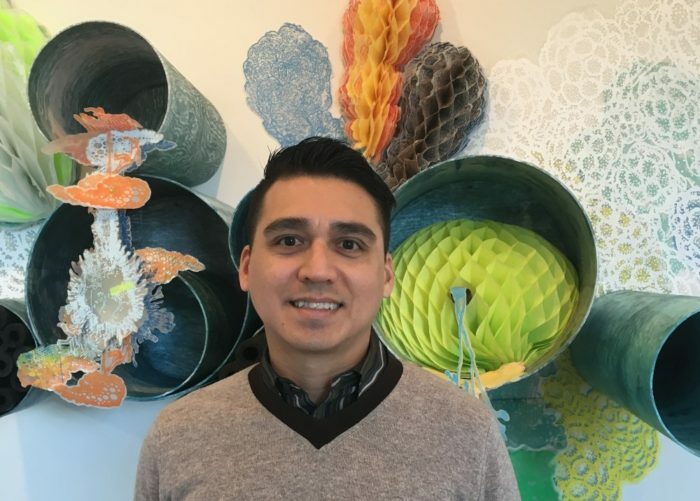 Alan Ruiz creates installations that are highly conceptual, and often site-specific, in a way that considers the site’s historical, spatial, and social contexts in the fullest possible sense. Beatrice Glow addresses the way that history informs and affects the present. Tammy Nguyen also investigates the complexity of the relationship between the past and present. Every time I see a new piece by either of those artists, it gives me pause. I have to stop and spend time with it because the work is so thought-provoking and relevant on many levels. An emerging artist I’m interested in is Austin Ballard, who will be showing in the Sunroom Project Space at Wave Hill next year. He’s an artist whose work I want to keep an eye on. Saya Woolfalk has gotten a lot of attention. Her work is endlessly fascinating, and I’m always impressed. There are also artists whom I’ve followed (and shown) in the last few years—Cecile Chong, Sara Jimenez, Joiri Minaya, Lina Puerta—and their work continues to develop in captivating ways; it never disappoints. I think I need to stop listing artists now because I could go on forever. 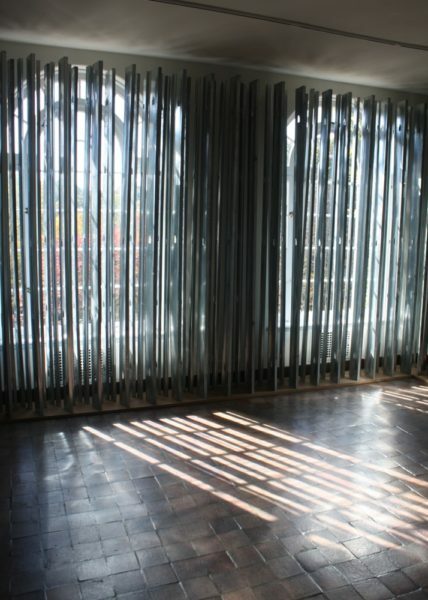 Alan Ruiz, Against Nature, 2013, steel studs, medium-density fiberboard, 10 2/3 x 17 1/2 x 16 feet, Sunroom Project Space, Wave Hill. Courtesy of the artist. 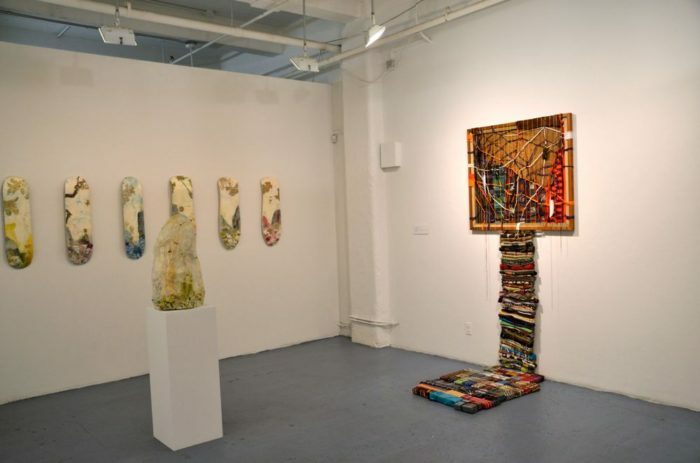 Dimensions Variable: Multiracial Identity (installation view), left to right: Cecile Chong, encaustic and mixed media on skateboards, 2010; Dennis RedMoon Darkeem, mixed media sculpture, 2013. Courtesy of the artists and Rush Arts Gallery. Glendalys Medina, Black Alphabet Series B, 2014, pen and paint marker on paper, 36 x 24 inches. Courtesy of the artist. Beatrice Glow, Rhunhattan, 2015, acrylic and decal collage on ceramic, ink on paper, dimensions variable, Sunroom Project Space, Wave Hill. Courtesy of the artist. Photo: Stefan Hagen.